TRAMANCO Pty Ltd have been involved with On-Board Weighing Systems since 1978 and from this experience have developed their own Electronic Weighing and Data Logging Systems for trucks and trailers. 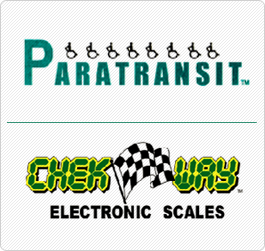 The Australian-made CHEK-WAY® ELIMINATOR Electronic Weighing System has come a long way since its conception in the late 1980’s. From basic gross weights with 2 channels, to Multi Function systems with up to 16 channels on the one system. The demand for this product came from the road transport industry which is concerned about PRODUCTIVITY, PROFITABILITY, SAFETY and IN-SERVICE COMPLIANCE issues. With the assistance of numerous transport operators TRAMANCO have eliminated many of the problems associated with On-Board Weighing (hence the name “THE ELIMINATOR”). The CHEK-WAY® Systems collect weight information from Air or Hydraulic Pressure Transducers connected to Air Bag or Hydraulic Suspensions and or from Load Cells mounted on the vehicles. This weight information is then sent to the meter where it displays the NETT or the GROSS weight of each individual group of axles as well as the total weights on the dual line, back-lit, LCD display of the meter, which has four individual sections. The addition of a Hand Held Remote receiver and a transceiver kit (in the vehicle’s cabin) allows the vehicle operator to be a safe distance away from his vehicle (approx. 50m) when being loaded and see the weights which are displayed on the Hand Held Remote’s dual line, back-lit, LCD display, at the same time as it is displayed on the cab mounted meter. All information is Date and Time stamped and can be downloaded to a lap top or to a printer so that a hard copy can be produced, on demand. Alternatively it can be sent out with a GPS co-ordinate attached over the mobile phone network for Proof of Delivery, or other management purposes. All data is stored in the built-in DATA-LOG® and cannot be deleted without a specific set of instructions (and password) from the operator. We were the first company to combine on-board weighing with data logging in a useful and auditable format for Tamper Evidency purposes under the I.A.P. Our systems are the only true digital, multiplexed systems which can handle up to 16 channels with the one meter. Printer data with operator’s name, vehicle serial number, time/date stamp, Nett and Gross weights etc. Such as from a simple single channel system through to 16 channels with RFID tag collection and collation with electronic run sheets and on-board P.C. with G.P.S. and etc. We provide simple but effective solutions to individuals and fleets by “adjusting” the software, to their specific needs. This way the hardware remains the same so that there is no planned obsolescence built into CHEK-WAY® like there is with other brands. In-service compliance issues are also addressed for both air and steel spring suspensions as well as driver I.D. for Fatigue Management purposes with Tamper Evidency, as standard. The CHEK-WAY® System is designed to work with a variety of makes and models of load cells and pressure transducers so that anyone who has the need or the desire to upgrade their data logging and weighing operation can do so at minimal cost by changing their electronics to CHEK-WAY® and using the existing transducers and/or load cells. TRAMANCO has designed, manufactured, developed and proven the CHEK-WAY® hardware and software in a large range of application in the Australasian environment and it works very simply and very well. The philosophy behind the development of CHEK-WAY® is that it gives the operators, the owner, and the driver, TOTAL CONTROL over PRODUCTIVITY and PROFITABILITY on a real time basis, as they are loading and unloading. At the same time the RAW-DATA® feature of the system allows for either instant or remote monitoring or review on an as-required, or regular basis, which enables real auditing to take place which is completely accurate. A simple “Plug-and-Play” interface is available for G.P.S. also. YES…. The system can be accessed, BUT…. All such attempts are automatically recorded with an incremental numerical stamp which is also time/date stamped. However this function is totally automatic and held in security so that no-one (us included) can tamper with it. The CHEK-WAY® ELIMINATOR is a totally modular system. All you have to do is contact TRAMANCO for software changes to your present CHEK-WAY® system and then add the various hardware to meet your requirements. This also means that the CHEK-WAY® system can be installed on any other scale system to upgrade the data capturing, and your management opportunities, accordingly. TRAMANCO Pty Ltd services the complete Australasian market and has been successful with the CHEK-WAY® ELIMINATOR……because it works. Call TRAMANCO and speak to one of their competent staff who will help find a SOLUTION for your Weighing and Mass Management requirements.